Brunch was invented in 1995 and started a new category of fresh spread and cooking specialty in Germany. 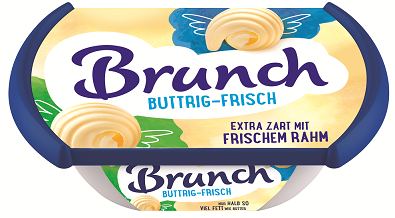 With a modern character, a fresh taste, a unique texture and original recipes, Brunch became a trusted brand with consumers. Above all, Brunch owes its success to its originality. Whether it’s the yoghurt-based recipe, the unique texture or the creative varieties, Brunch always has a surprise in store. The most popular varieties include “Original” and “Fine Herbs”, produced using fresh cream, making them all the more smooth and luxurious. And for calorie-counting gourmets, there is “Brunch Balance” that retains the famous extreme-fresh, creamy taste, but with just 16% fat. Full-fat or light, mild or spicy, there’s a Brunch to suit everyone. The range is broader, now including seasonal flavours. With original creations such as “Cowboy” with smoked ham and chilli, “Indianer” with curry, “Zuckerbrot” with white chocolate, “Peitsche” with spicy salami, and even “Schneeweißchen” with zabaglione. Launched in 1987 by Corman, the world leader in functional butters, the Balade brand took over the Belgian market with its range of light dairy products. Balade is the result of unique expertise that manages to lighten everything – except the taste.